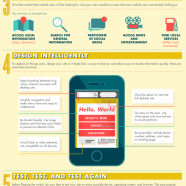 How much puts your business on mobile user’s online experience? Small businesses should focus on mobilizing their conventional websites in the first place, as mobile internet users are increasing exponentialy and they’re craving for local information, products and services. Are you gonna stay out of the game? This guide simplifies the process of giving you site a mob face.